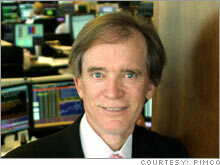 We have a secret banking system built on derivatives and untouched by regulation, says Pimco's Bill Gross. Here's how to protect your pocketbook. (Fortune Magazine) -- The tangled web of subprimes has claimed more than its share of victims in recent months: homeowners by the hundreds of thousands, to be sure, but also those who created, packaged, insured, distributed, and ultimately bought what should have been labeled "junk mortgages" but which by a masterstroke of marketing genius received a more respectable imprimatur. "Skim milk masquerades as cream," warned Gilbert and Sullivan over a century ago, and sure enough, today's subprimes, packaged into financial conduits with monikers such as SIVs and CDOs, pretended to be AAA-rated cubes of butter. Financial institutions fell for the ruse, and now we all suffer the consequences. Defaults are rising, the dollar's sinking, and -- good Lord! -- even Google's (Charts, Fortune 500) stock price is going down. Something must really be wrong. It is. What we are witnessing is essentially the breakdown of our modern-day banking system, a complex of leveraged lending so hard to understand that Federal Reserve chairman Ben Bernanke required a face-to-face refresher course from hedge fund managers in mid-August. My Pimco colleague Paul McCulley has labeled it the "shadow banking system" because it has lain hidden for years, untouched by regulation, yet free to magically and mystically create and then package subprime loans into a host of three-letter conduits that only Wall Street wizards could explain. It is certainly true that this shadow system, with its derivatives circling the globe, has democratized credit. And as the benefits of cheaper financing became available to the many as opposed to the few, placating and calming waves of higher productivity and widespread diversification led to accelerating economic growth, incomes, and corporate profits. Yet, as is humanity's wont, we overdid a good thing, and the subprime skim milk has soured. Still, to equate rancid milk with a breakdown in today's banking system is a bit much, don't you think? Aren't our central bankers coming to the rescue with lower interest rates, and doesn't Treasury Secretary Hank Paulson finally have a plan to steady Citigroup (Charts, Fortune 500) and friends with a "super-SIV"? They are, and he does -- but cheap financing and SIV bailouts may not be enough to restore confidence in a shadow system built on fragile foundations. Financed conduits supported by $1 trillion of asset-backed commercial paper were constructed on the basis of AAA ratings that suggested -- no, practically guaranteed -- that the investments could never fail: no skim, just the cr�me de la cr�me. Now, as the subprimes undermine those structures and the confidence in them, it is a stretch of the imagination to suggest that 75 basis points of interest rate cuts by the Fed will bring back the love. As the commercial-paper market shrinks by hundreds of billions of dollars a month, central banks worldwide are facing a giant stress test of the shadow banking system. The publicized and photographed overnight "runs" on Countrywide and Britain's Northern Rock in mid-August were nothing compared to what's taking place in the shadows of the real banking system. How does one protect during a run "deposits" that no one can see? To be blunt, what does it mean for your pocketbook? To understand where future losses may lie, it makes sense to ask which investments did especially well during the shadow's formation. Home prices have been the obvious first hit -- down 5% nationwide already, with perhaps another 10% to go over the next several years. Following in lockstep have been financial stocks with subprime exposure, to be joined in short order by consumer-based equities, as jobs and disposable income falter. These investments thrived as the shadow worked its voodoo; now its curse will sap money from the pockets of any and all who believed in its black magic. Importantly, add to the list of investment victims the strength and viability of our national currency. The SIVs and CDOs of years past supported the dollar at unrealistic levels as foreign investment in the hundreds of billions poured into our markets. Now, with confidence waning, the visible but unphotographable run from George Washington into the euro, the yen, and other currencies is under way. Protecting an American-made pocketbook should begin by seeing that purchasing power is more likely to be enhanced via investments in strong currencies, not weak ones. More than ever, your portfolio should have a international perspective and include non-dollar-denominated assets. Investors should anticipate that the shadow's successor will be a more conservative, less risk-oriented banking system. The shadow writes, and having writ will move on to new sources of wealth creation in faraway corners of the globe. Go with it. Stocks: A strong end to a 'meh' March? Market indexes are shown in real time, except for the DJIA, which is delayed by two minutes. All times are ET. Disclaimer LIBOR Warning: Neither BBA Enterprises Limited, nor the BBA LIBOR Contributor Banks, nor Reuters, can be held liable for any irregularity or inaccuracy of BBA LIBOR. Disclaimer. Morningstar: © 2014 Morningstar, Inc. All Rights Reserved. Disclaimer The Dow Jones IndexesSM are proprietary to and distributed by Dow Jones & Company, Inc. and have been licensed for use. All content of the Dow Jones IndexesSM © 2014 is proprietary to Dow Jones & Company, Inc. Chicago Mercantile Association. The market data is the property of Chicago Mercantile Exchange Inc. and its licensors. All rights reserved. FactSet Research Systems Inc. 2014. All rights reserved. Most stock quote data provided by BATS.